Making a big change to your bedroom doesn't require a remodeling project. Swapping out your bedding and throw pillows gives it a new look in no time. Here's how to layer blankets, pillows and duvets to create a modern bedroom with three distinctly different points of view. Go beyond monochromatic by mixing patterns and materials. 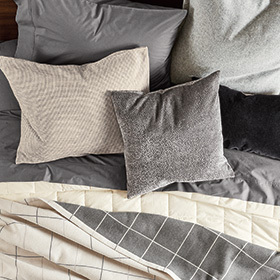 Start with our Apex blanket for a modern take on a classic pattern and add interest with a subtly textured Stones pillow and an oh-so-smooth Percale sheet set. Pairing these hues creates a calm feel while also providing saturated color. 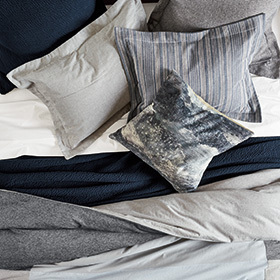 Our Converge duvet cover sets the foundation by bringing in both sky blue and grey. A Storm pillow and Millay sham add modern patterns to this look. Warm colors liven up a modern bedroom. Start with the variegated stripes on our French ticking-inspired Millay duvet cover and sham and turn up the color volume with a luxurious Mohair pillow. 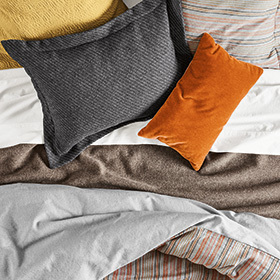 Shop all Room & Board bedding here.